Colleges are inflating federally defined tuition cost to give athletes bigger sports scholarships. Colleges want to sweeten athletic scholarships. So they inflate the cost of attendance to give more money to athletes but not others. 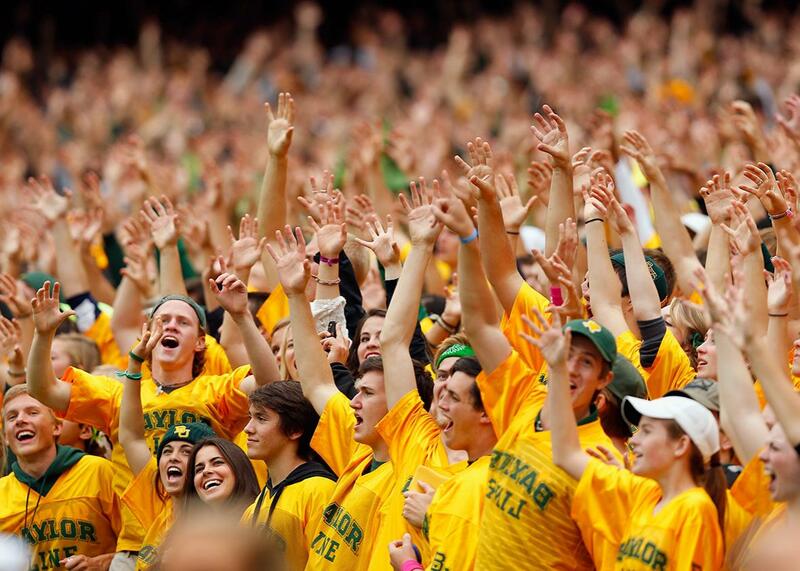 Baylor Bears fans cheer on their team against the TCU Horned Frogs at McLane Stadium on Oct. 11, 2014, in Waco, Texas. Would they still be cheering if they knew what was happening to their cost of attendance? Some colleges and universities that play big-time intercollegiate sports are sharply increasing the federally defined cost of attendance for students at their institutions this year—letting them provide several thousand more dollars in stipends for scholarship athletes, but resulting in little if any additional funds for other students. The maneuvering is an outgrowth of the January vote by the National Collegiate Athletic Association’s five wealthiest sports conferences to increase the value of athletic scholarships to include the full cost of attendance. Athletes receiving a full scholarship to play on a college team can now also receive a stipend to cover the difference between that scholarship and the various other expenses that accompany being a college student, such as paying for food, laundry, and travel. This summer, some institutions adjusted their cost of attendance figures just as those estimates suddenly became useful as a recruiting tool. And financial aid analysts are worried that athletics departments are now improperly influencing those numbers to the benefit of revenue sport athletes, but the detriment of other students. What colleges list as full cost of attendance is important, as it defines the limits of a student’s available financial aid and figures significantly into determinations of how much aid a Pell Grant recipient is due and how much in federal loans a student is able to borrow. The federal government provides guidance and tracks these figures but allows college financial aid officers to determine what an appropriate estimate is for their institution, though colleges must justify those amounts in some way. The large variance among institutions—owing to factors such as cost of living being different from one city or state to the next, for example—has been mostly uncontroversial. That’s changed now that cost of attendance has become part of the intercollegiate athletics arms race. The decision to offer full cost-of-attendance stipends was an attempt by the NCAA’s members to address rising criticism that colleges aren’t doing enough to help the students, many from low-income backgrounds, who help some institutions bring in millions of dollars in ticket sales and television contracts. It didn’t take long for coaches and athletic directors to see the recruiting possibilities the change in financial aid could offer. During the conference’s spring meetings in May, Saban called foul. As it turns out, Saban didn’t have much to worry about. Soon after his comments, the University of Alabama increased its cost-of-attendance estimate, and with it the amount Saban’s players could receive as a stipend. Deborah Lane, a spokeswoman for the university, said the cost of attendance was estimated “using the same methods [the university] has always used,” though the increase was much higher than normal. Alabama is now offering one of the largest stipends in college football: $5,386 each year to out-of-state athletes and $4,172 to in-state athletes. The push to give athletes a stipend to cover the full cost of attendance has been taking place for decades, but in recent years the concept has found stronger support. In 2003, the NCAA began allowing athletes to receive aid through Pell Grants and need-based scholarships. Five years later, the NCAA settled a lawsuit over the association’s practice of capping scholarship amounts. The settlement cost the NCAA $228 million. In 2011, the NCAA’s Division I Board of Directors voted to adopt a $2,000 stipend that would cover an athlete’s full cost of attendance, but 125 Division I institutions then voted to override the decision, scuttling the increase. By 2014, the NCAA continued to face a number of lawsuits over the issue, and pressure—including from the U.S. Senate—was building to find a way to close the financial aid gap. Recent court rulings have added additional pressure by bolstering the idea that the NCAA violates federal antitrust law by capping scholarship amounts. Last August, the Division I Board of Directors voted to restructure how its members govern themselves, granting a greater level of autonomy to the five wealthiest conferences. The Atlantic Coast, Big Ten, Big 12, Pacific-12 and Southeastern conferences could now make their own rules concerning a number of issues, and full cost of attendance was at the top of their list. In January, the conferences voted to approve the stipends. All but one of the 65 institutions voted in favor of the change. The NCAA estimated at the time that the stipends would increase aid amounts by about $2,500 per athlete, or about $30 million a year across all programs. It soon became clear the NCAA’s estimates fell short at many institutions, including most of the SEC and about half of the Big Ten. So far, the stipends are mostly going to full-scholarship football, men’s basketball, and women’s basketball players, with some other female athletes receiving them to ensure colleges aren’t running afoul of Title IX considerations. In July, the NCAA announced that it would distribute $18.9 million across Division I, or about $55,000 per institution, to help colleges pay for the stipends. An NCAA spokeswoman this week referred all questions regarding the increases to individual institutions. Some coaches who are fortunate enough to work at colleges that already listed higher full cost-of-attendance amounts have not been coy about what those larger stipends could mean for recruiting. James Franklin, head football coach at Pennsylvania State University, now touts the fact that the university has one of the highest costs of attendance in the country. David Ridpath, professor of sports administration at Ohio University and president-elect of the Drake Group, said that while colleges may be getting creative at the behest of coaches, Richt is likely correct in saying that no rules are being broken. Like Alabama’s Saban, Richt earlier expressed alarm over the danger of his institution offering stipends that were so much lower than those at institutions like Auburn, only to have the expected amounts increase before the start of the season. Last month, Georgia adjusted its cost-of-attendance figures, and the size of the gap that could be addressed by the stipend increased from $1,798 to $3,221 for in-state students and $3,743 for out-of-state students. A Georgia spokeswoman said the university does not offer any academic scholarships for nonathletes that cover full cost of attendance, and financial aid experts interviewed for this story said that the cost categories that are increasing—transportation and miscellaneous expenses—are not typically covered by full-ride academic scholarships at many institutions. How such a change would affect nonathlete students is not entirely clear, said Mark Kantrowitz, a leading financial aid expert, but it’s not likely that they will benefit from the arrangement. Kantrowitz, senior vice president and publisher at Edvisors, said the stipends “certainly act as a recruiting tool,” and if colleges are artificially inflating cost-of-attendance figures to make those stipends larger, then nonathletes could shoulder the extra costs. Georgia officials said its increase was a result of financial aid officers taking an overdue look at whether the numbers in those two categories were up-to-date and finding that they weren’t. The transportation cost was figured by calculating the expense of four trips each semester to Warner Robins, a centrally located city in Georgia, for in-state students, and four round-trip flights to Chicago for out-of-state students. The miscellaneous expenses are based on the 2013 Consumer Expenditure Survey published by the U.S. Department of Labor, which includes estimated costs for clothing, laundry, cleaning supplies, entertainment, and cellphone bills. The increase at Alabama was also confined to the travel and miscellaneous categories of the cost-of-attendance budget, as was most of a $2,000 increase at Rutgers University, which is offering stipends between $4,100 and $4,900. Last year’s full cost-of-attendance estimates at Rutgers, according to the U.S. Department of Education, would have resulted in stipends of about $2,100. Karen McCarthy, a policy analyst for the National Association of Student Financial Aid Administrators, said that it’s not uncommon for cost of attendance to fluctuate from year to year, but it is unusual to see such sudden and sizable increases in expense categories like travel. McCarthy said it’s possible that the recently increased interest in cost of attendance has simply prompted institutions to re-examine those estimates. NASFAA is worried about the stipends being used as a recruiting tool, however, McCarthy said, and whether that is influencing financial aid decisions. Mark Nagel, professor of sports and entertainment management at the University of South Carolina, said that unless the stipends become standardized in some way, full cost-of-attendance numbers could rise at other colleges. Correction, Aug. 13, 2015: Due to an editing error, a headline on this post originally misstated that colleges were inflating tuition. They are adjusting cost-of-attendance numbers, not tuition.